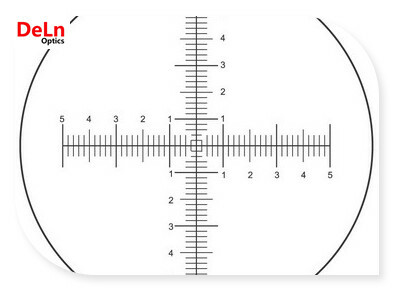 Reticles are insertion in the eyepiece of an imaging system that superimpose either a crosshair or concentric circle pattern on the imaged object. The pattern provides a reference location and allows the imaged object to be centered. Many of reticles are available with positive and negative patterns. The positive reticles consist of low-reflectivity, vacuum-sputtered chrome patterns plated on clear substrates and are useful for front-lit and general applications. The negative reticles use the same chrome coating to cover the substrates, leaving the patterns clear, and work well in back-lit and highly illuminated applications. Reticles are available in a wide range of patterns, including crossline, micrometer scales, or grids.The masks used in mask lithography are very precise. DELN can be used to make gratings, microlens arrays, pttern, and a wide variety of other optics.